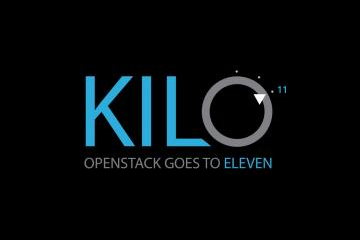 The latest "Kilo" version of OpenStack released last week emphasizes the growing stability of core services, better driver compatibility and an extension of the platform to fit workloads with bare metal and containers. Ironic Bare-Metal Provisioning: Kilo sees the first full release of the Ironic bare-metal provisioning project with support for existing VM workloads and adoption of emerging technologies like Linux containers, platform-as-a-service and NFV. Users can place workloads in the best environment for their performance requirements. Ironic is already used in production environments including Rackspace OnMetal. 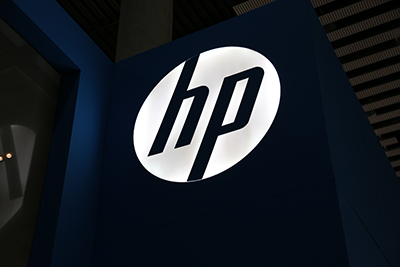 HP made multiple technical contributions to the OpenStack Kilo release, including new converged storage management automation and new flash storage technologies to support flexible, enterprise-class clouds. HP said its storage contributions to the OpenStack Kilo release focus on two strategic goals: supporting application-centric, automated, converged storage management; and, helping make environments that use Kernel-based Virtual Machine (KVM) server virtualization technology truly enterprise-ready. Evaluator Scheduler—improves management productivity and increases resource efficiency by automatically assigning storage resources to meet incoming requests based on workload requirements. Adaptive Flash Cache—reduces the overall cost of delivering I/O-intensive workloads in cloud environments by allowing “flash caching”—the use of flash capacity as a virtual extension to storage system DRAM cache. Thin Deduplication with Express Indexing—drives up capacity utilization and increases the life of flash drives used for virtualized workloads by 75 percent via data compaction using inline, block-level deduplication. Manila files services—allows HP 3PAR StoreServ Storage to serve both block and file workloads in open cloud and hybrid environments using a single, cost-optimized pool of storage that occupies one third less space. NTT DOCOMO outlined a medium-term vision to widen the scope of its business and collaborate with new partners for valued-added networking services. Under the +d (pronounced "plus d") initiative, DOCOMO will share its extensive business assets with partner companies for streamlined collaboration. Services co-created through such efforts will be branded with unified names that begin with the letter "d." DOCOMO will strive, together with its partners, to empower customers in ways that enable them "to realize more affordable, enjoyable and convenient lives." The alignment of service brands under the "d" banner will include a unified docomo Point system (dPOINT), a docomo Premier Club membership program, a Docomo credit card service (dCARD), and a common docomo customer ID (dACCOUNT). Docomo is hoping this approach can be adopted in a variety of fields, including medicine, agriculture, education, local governments, etc. In view of its 2020 planning, Docomo expects its forthcoming 5G deployments will pave the way for partners to develop innovative services around its platform. Concurrent, which specializes in high-performance Linux and storage solutions, introduced a software-defined storage solution featuring an open-source Ceph-based object storage that supports the more demanding performance requirements of mission-critical applications. 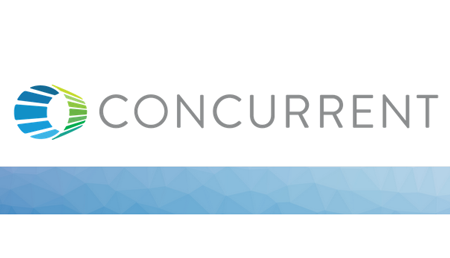 Concurrent’s storage platform offers modular scaling, open hardware integration, on-the-fly capacity upgrades, and self-healing capabilities. Support is included for the latest disk drive and solid state storage technologies to enable ultra-high density configurations and scalable storage complexes reaching exabyte capacity levels. The system also includes an intuitive system dashboard and support for industry standard open interfaces such as OpenStack Swift, Amazon S3, HTTP, and FTP for easier installation, integration, and maintenance. Concurrent’s object storage solution is powered by Concurrent’s open source, real-time Linux operating system, RedHawk, which boasts extremely low-latency operation, advanced tuning capabilities, and real-time determinism for guaranteed results. RedHawk and its associated optimization tools improve application performance by unleashing the untapped potential of commercial x86-based hardware platforms. The market for deep packet inspection (DPI) solutions deployed as a virtual network function (VNF) will grow at a 66 percent compound annual growth rate from 2014 to 2019, according to a new report from Infonetics. Sandvine and Allot are neck-and-neck in the race for the DPI market share lead, followed by Cisco and Procera. “As operators evaluate likely targets for virtualization as part of a larger network functions virtualization strategy, DPI is a clear target, though ongoing concerns around performance and capacity will constrain the market for virtualized DPI in the short term,” said Shira Levine, research director for service enablement and subscriber intelligence at Infonetics Research, now part of IHS. AT&T is now offering its Business Fiber Internet service in more than 180 U.S. cities at speeds of up to 300 Mbps, with plans to offer symmetrical 1 Gbps service soon. The service is not available in all commercial buildings. “Business owners constantly tell us that they need blazing fast Internet speeds to stay ahead," said Tom Hughes, vice president, AT&T Small Business. 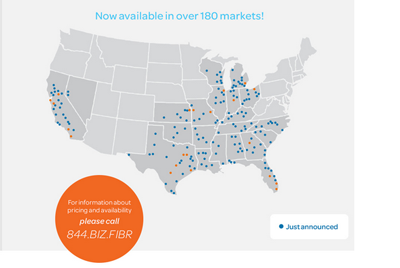 "AT&T Business Fiber in more than 180 cities helps give companies just that. The ability to upload and download at the same high speed allows companies to work faster with customers, partners and suppliers." 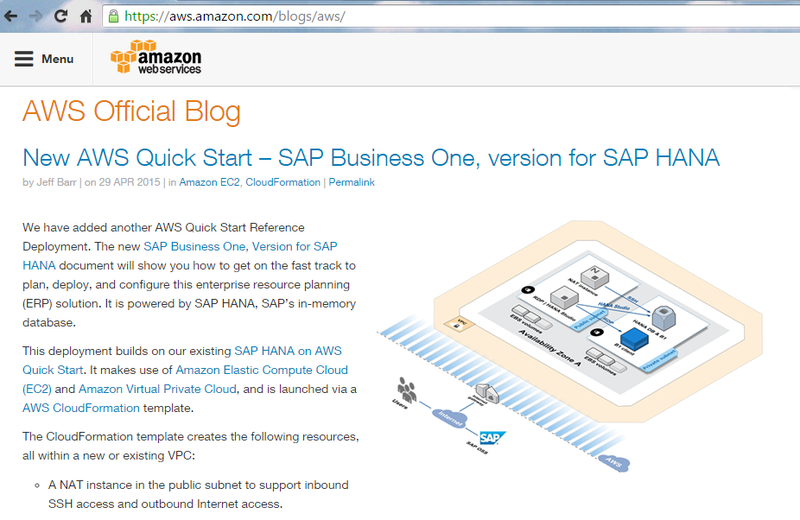 Amazon Web Services has added a Quick Start reference deployment for the new SAP Business One, Version for SAP HANA in-memory database. The deployment builds on the existing SAP HANA on AWS Quick Start, which makes use of Amazon Elastic Compute Cloud (EC2) and Amazon Virtual Private Cloud. The solution is launched via a AWS CloudFormation template.